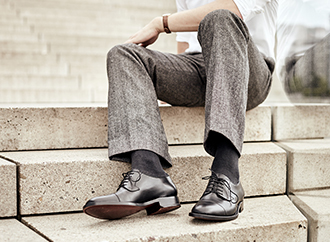 First-rate materials paired with perfect craftsmanship and artful design form the foundation of long-lasting men’s shoes shoes made by Heinrich Dinkelacker, which are known for their elegant charm. This not only makes the footwear dependable, but also lets wearers use it to express their personal sense of style. Our shoes, which likely represent the most exclusive men’s footwear in Germany, are carefully handcrafted in one of the oldest factories in Europe. Each pair of shoes, designed by a skilful master hand, passes through slightly over 300 work steps in our Budapest factory before reaching its new owner. Each step of the process emphasises perfection through to the very end — this has ensured the extraordinary quality of our shoes from the very beginning. Sewn-welting and double-stitching are considered as some of the most premium shoe manufacturing processes worldwide, and for good reason. These meticulous, cost-intensive shoe assembly processes, during which sophisticated materials are perfectly combined with one another, guarantee the special flexibility, pleasant wearing comfort, extraordinary durability and ease of repair of each men’s shoe in the Heinrich Dinkelacker collection. Only the best leathers from renowned tanneries around the globe suffice for the premium production processes in the Heinrich Dinkelacker shoe factory: buffalo calf from Italy, gleaming box calf and premium calf velours from France, robust water buffalo from Germany, soft calf from Italy, greased and waxed nubuck from Germany or the coveted shell cordovan that is made in only a handful of tanneries, most famously Horween in Chicago. Over the course of its history, Heinrich Dinkelacker has perfected the fit of the shoes in its collection, setting new standards in the luxury shoe segment. We create custom footwear, and also use standardised last forms to accommodate different shapes of the balls of the feet, instep and heel, which vary from customer to customer. Do not be fooled by their name — these ‘standard lasts’ are a far cry from those used for conventional ready-made shoes. They are specially developed by experienced shoemakers; some have been sued to make quality footwear for 60 years. A steady hand, keen concentration and the utmost precision are required in order to meet the high aesthetic and functional requirements of making a Heinrich Dinkelacker shoe. From cutting the leather and hand-stitching the welt, to inserting the trademark brass pins and metal sole protectors, through to adding the personal signature of the master shoemaker, we assemble our shoes in a way that reflects our passion for extraordinary footwear, down to the most minute details.